This report is the result of collaboration between Article18, Middle East Concern, CSW and Open Doors International. During 2018, the Iranian Christian community, along with other religious minorities, continued to suffer multiple violations of their right to freedom of religion or belief. Ongoing surveillance of Christians by the authorities was often accompanied by harassment. The end of 2018 saw an unprecedented wave of raids on private house gatherings, leading to a large number of arrests. Many Christians received prison sentences, or had sentences upheld by the Court of Appeal. 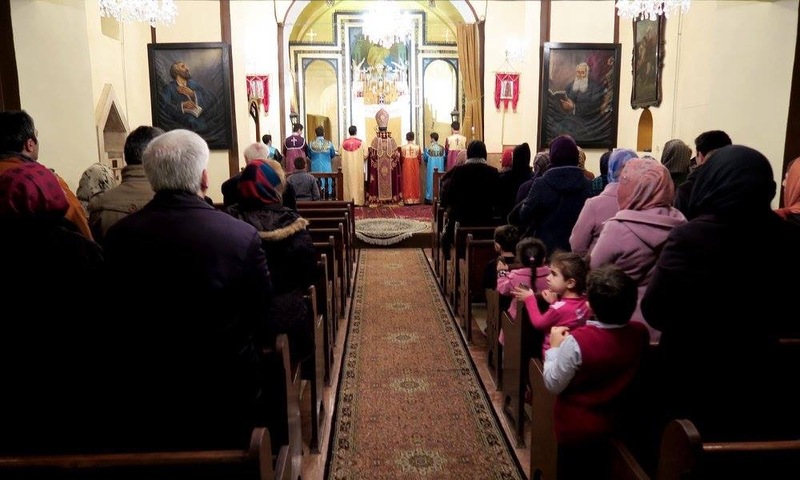 Most of the reported violations involved converts from Islam, but there were also several instances where members of the recognised Armenian and Assyrian Christian minorities were imprisoned or sentenced to jail terms due to their religious activities. Recognized church buildings remained closed to ethnic Persian Christians and, in several cases, church property remained under threat of confiscation. Everyone shall have the right to freedom of thought, conscience and religion. This right shall include freedom to have or to adopt a religion or belief of his choice, and freedom, either individually or in community with others and in public or private, to manifest his religion or belief in worship, observance, practice and teaching. No one shall be subject to coercion which would impair his freedom to have or to adopt a religion or belief of his choice. Freedom to manifest one’s religion or beliefs may be subject only to such limitations as are prescribed by law and are necessary to protect public safety, order, health or morals or the fundamental rights and freedoms of others. The States Parties to the present Covenant undertake to have respect for the liberty of parents and, when applicable, legal guardians to ensure the religious and moral education of their children in conformity with their own convictions. Although Iran ratified the ICCPR in 1975, it fails to uphold the values enshrined in it, including the right to freedom of religion or belief for all of its citizens. This report records the violations experienced by the Christian community during 2018. Religious and political leaders in Iran continue to speak out against Christianity. It is therefore unsurprising that the Christian community experiences repression in various forms. The Iranian intelligence service (MOIS) closely monitors Christian activity and, together with the Revolutionary Guard (IRCG), has raided Christian gatherings in private homes, arresting all in attendance and confiscating personal property. Those arrested have been subjected to intensive and often abusive interrogation. In June 2018, Christian convert Fatemeh Mohammadi released a letter detailing the sexually abusive interrogation she had undergone when she was arrested and detained in Evin Prison in Tehran. For nearly a decade, Persian Christians, who are generally converts from Islam, have been prohibited from entering official church buildings. They have consequently been forced to resort to informal meetings, frequently called “house churches”, which are regularly targeted by the security services. This prohibition, and the subsequent targeting of house churches, not only constitutes a violation of the right to freedom of religion or belief, but also of the right of peaceful assembly and association. Not only did the prohibition continue in 2018; there were also regular reports of house churches being raided, with a surge during November and December 2018 as arrests were reported in the cities of Ahvaz, Chalus, Damavand, Hamedan, Hashtgerd, Karaj, Mashhad, Rasht, Shahinshahr and Tehran. In one week alone, one hundred and fourteen Christians were reported to have been arrested. In March 2018, twenty Christians associated with house churches were arrested in Karaj and six were detained. On 10 April 2018, Christian convert Mohammadali Yassaghi was arrested in Mazandaran Province, North Iran. He was held in Babol Prison, Mazandaran Province, on charges of “propaganda against the establishment.” On 25 June 2018, Mohammadali Yassaghi was brought before a judge in the 102 Revolutionary Court of Babol. The judge acquitted him, rejecting the charges. It was reported that on 17 and 18 June 2018 five Christian converts had been arrested in Karaj and West Tehran. Those arrested were named as Razmik Zadourian, Shahab Bani Bayat, Mohammad Mohaghegh Dolatabadi, Shahin Shakib, and Vahid Dehghani. On 16 November 2018, two Christian converts were arrested after arranging to hold a meeting in Mashhad. Behnam Ersali was arrested in Mashhad and Davood Rasooli was arrested in Karaj. On 2 December 2018 four Christian converts were arrested in Ahvaz. Sisters Shima and Shokoofeh Zanganeh were arrested together with Farzad Behzadizadeh and Abdollah Yousefi. Shima and Shokoofeh Zanganeh were both physically assaulted during interrogation. Shokoofeh Zanganeh was released on bail of US$44000 on 25 December, and Shima was released on bail of US$44000 on 31 December 2018. On 6 December 2018 intelligence agents raided the home of Amir Taleipour and his wife, Mahnaz Harati, arresting them in front of their 7-year old daughter. In December 2018 nine Christian converts were arrested in Alborz province during Christmas celebrations. In 2018 there were many reports of Christians, mainly converts, being arrested. Those arrested often faced pressure to recant their faith or sign commitments not to meet with other Christians. Those who did not comply were detained and generally faced charges related to evangelism, engaging in “illegal” house churches or acting against “national security.” They were eventually released conditionally on payment of bail pending a court summons. As a result of the pervasive and ongoing repression, during 2018 Christian converts and those from ethnic minorities continued to flee the country. In 2018 churches which used to hold services for Farsi-speaking Persian Christians remained closed. These include St. Peter’s Presbyterian Church and Emmanuel Presbyterian Church in Tehran, Assemblies of God Central Church, Tehran, and Assemblies of God churches in Janat-Abad, Ahvaz, and Shahinshahr among others. In addition, the Assemblies of God retreat centre in Karaj, the Garden of Sharron, was issued a confiscation order on 7 March 2018. A number of Iranian Christians are either still serving prison sentences or were released in 2018. Several appealed their sentences during 2018. However, with few exceptions, the sentences were upheld. On 2 May 2018, Yousef Nadarkhani, Yaser Mosibzadeh, Zaman (Saheb) Fadaie and Mohammadreza Omidi were informed that the 10-year prison sentences given on 14 June 2017 at the 26th Branch of the Revolutionary Court in Tehran for “acting against the national security through propagating house churches and promoting Zionist Christianity” had been upheld. On 22 July 2018, ten police officers arrived at Yousef Nadarkhani’s home and physically assaulted Yousef Nadarkhani’s son, Danial, when he opened the door to them. Both Yousef Nadarkhani and his son were tasered, despite offering no resistance. Mohammadreza Omidi and Zaman (Saheb) Fadaie were arrested on 24 July and Yasser Mosibzadeh on 25 July before being taken to Evin Prison to serve their sentences. The men had received no official summons prior to the arrests. On 6 January 2018, Shamiram Issavi Khabizeh, the wife of Rev. Victor Bet Tamraz, was sentenced to 5-years’ imprisonment for “membership of a group with the purpose of disrupting national security and another five years in prison for “gathering and colluding to commit crimes against national security.” An appeal is ongoing – the first session of the Court of Appeal has since been held. In May 2018, Majidreza Souzanchi Kushani, a Christian convert detained in Evin Prison, was sentenced to 5-years’ imprisonment for “membership of evangelistic groups and conducting evangelism.” Majidreza Souzanchi and Fatimeh Mohammadi, another Christian convert, had been arrested in November 2017. On 20 June 2018, 12 Christian converts from Bushehr were given prison sentences of one year each for “propaganda activities against the regime through the formation of house churches.” They were also under intense pressure to recant their faith. On 11 July 2018, Ramiel Bet Tamraz, son of Rev. Victor Bet Tamraz, was sentenced to prison for four months for “spreading Christian propaganda.” The sentence is being appealed. On 22 September 2018, Zaman (Saheb) Fadaie – already serving a 10-year sentence in Evin Prison – received an 18-month prison sentence for “spreading propaganda against the regime.” Fatimeh Bakteri received a 12-month sentence for the same charges. For the government of Iran to uphold the right to freedom of religion or belief for every citizen regardless of their ethnic or linguistic group, and including converts from other religions. We also call on members of the international community to assist in holding Iran accountable for upholding its obligation to ensure and facilitate freedom of religion or belief for all of its citizens by highlighting this principle during political or economic discussions with, or concerning, the nation. Finally, we ask the UN Special Rapporteur on the human rights situation in the Islamic Republic of Iran and the Special Rapporteur on freedom of religion or belief to consider investigating and issuing a report on the ongoing mistreatment of Christians and other religious minorities in Iran.